Taco Bell's Diablo Sauce Is Back. Permanently. Although the heat (and, uh, consequences) probably followed you long after eating it, Taco Bell's wickedly hot Diablo Sauce was only around for a short, limited time run at this time last year. Its scarcity even inspired enterprising hot sauce peddlers to sell packets of the stuff on eBay. 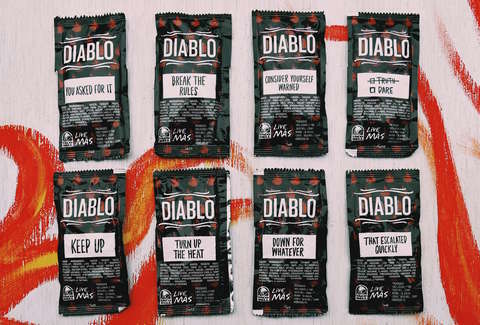 But now, you'll be able to grab fistfuls of the stuff at your local T-Bell, because Diablo Sauce is back -- and for good. In a surprise announcement via social media on Tuesday night, Taco Bell said the fiery sauce will permanently return to its restaurants on Thursday, May 5th, exactly a year after it first debuted. Oh, and Cinco de Mayo. In case you had any doubts, Diablo Sauce doesn't just pack more heat than your go-to Fire Sauce, it's stupidly spicy. When it launched last year, Taco Bell boasted Scoville Scale spiking ingredients like aji panca, chipotle, and chili peppers. Basically, it's painfully good... if you're up for a multi-day commitment. But then again, you are eating at Taco Bell, right? In other T-Bell news, the chain is reportedly testing a new Jalapeno Popper Quesarito in Charlotte, N.C., so keep a bleary, hot sauce tear-filled eye out for that, too. Tony Merevick is Cities News Editor at Thrillist and wonders how quickly Taco Bell locations will run out of this stuff. Send news tips to news@thrillist.com and follow him on Twitter @tonymerevick.